The Utica Community Hall was built in 1916. Initially it had no indoor plumbing, running water or electricity. The structure has always been a community center. The original owner was a saloon keeper who donated the hall with the stipulation that it would remain a community center. 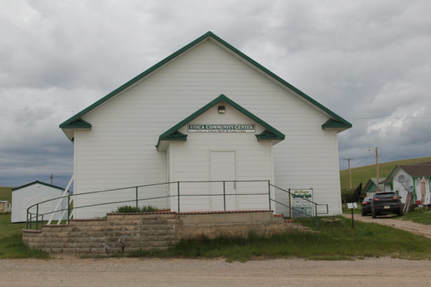 The Community Hall was used for school programs, area events and dances. The hall has been vacant for nearly thirty years. Ron Peevey, a retired general contractor and newly located resident admired the building. In March 2007, Ron was quoted by the Fergus Electric newsletter, "there is nothing I like better than to take a dilapidated old place and turn it into something beautiful and useful." Mr. Peevey, a member of the Rod & Gun Club, proposed to its members renovating the Utica Community Hall. The Flanagan's donated the hall to the Rod & Gun Club. The ambitious members of the Rod & Gun Club set their sites on a vision to renovate and improve the Utica Community Hall. They identified a need for area communities to have a place to gather and enjoy the advantages of rural living. The Rod & Gun Club was assisted by the Snowy Mountain Development Corporation and Jennifer Pfau assisted with the grant writing. Initial donations and grant awards resulted in $16,000 to allow the project to move forward. Local volunteers and businesses have assisted with the continued renovation costs. One of the advertised fund raising events was the purchase and donation of laser etched bricks. Bricks were purchased and personalized with indiviuals own creative messages. The bricks will be placed and cemented on the steps and front porch of the Utica Community Hall - creating a forever commitment from the individuals and businesses who have so graciously participated in the fund raising efforts for this great cause.